The forms are being built for the walls. There is an inner and an outer form and in the middle ~ re-bar. The walls will be poured in 8 different sections. Section #1 is scheduled to be poured this Friday, April 12 starting at 10 am. It is anticipated that there will be 4 concrete trucks to pour this section. Each wall section thereafter is scheduled to be poured every 2-3 days as they work their way around the floor. While pouring the outside walls, the crews may choose to start work on the columns inside of the reservoir as well. Once the columns are finished, then the last section of wall (Section #8) will be poured. It is anticipated that work on the walls and columns will continue until mid to late May. When the walls and columns are complete, then the roof work will begin. From Snow to Floor in 15 days! 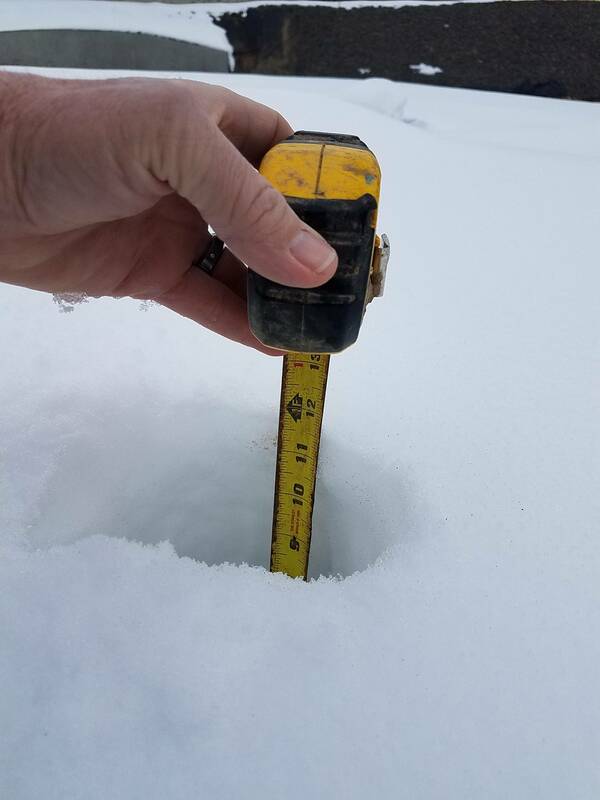 On March 12, 2019 the Minnesota Reservoir site was covered in snow. A LOT of snow as the pictures show. 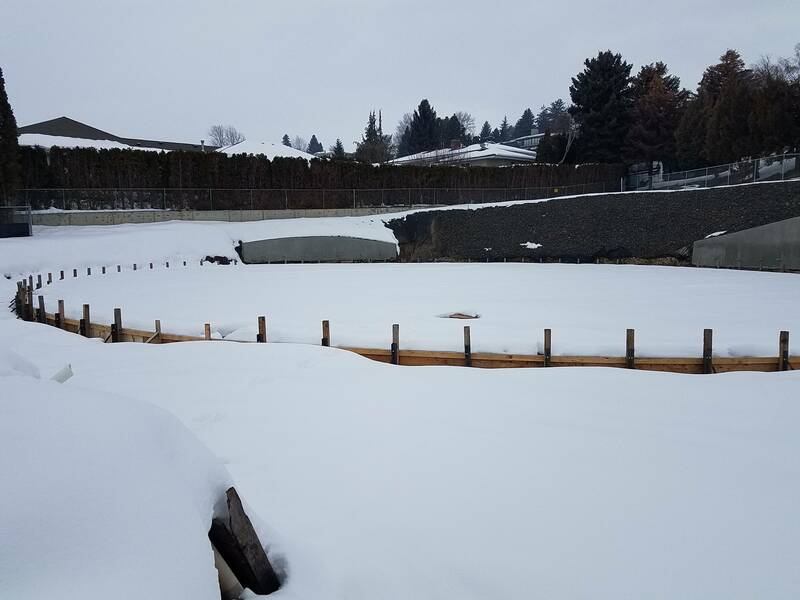 But, by March 29, just 17 short days later, the snow was gone and the concrete crews were ready to get the floor poured! Friday the crews were set up and ready to go before the sun was even up. The first load of concrete arrived about 6:30 AM. The concrete was poured from one side of the reservoir to the other. In the 3rd photo below, you can actually see the concrete being poured. You can click a picture to zoom in. The next shots are thanks to a drone operator in the area that took some shots after the floor was about half-way done. The circles that you see will be columns supporting the roof of the reservoir. While the crew was working the cement, they wore metal "skis" that helped to distribute their weight across the concrete as they finished the concrete. The final shot shows everyone working the concrete either by hand or by machine. Although we had a few sprinkles, the weather cooperated for the most part. We would like to thank our neighbors for their patience with this early start time. The concrete trucks will be backing into the site and that will mean that their back up alarms will be heard starting before 6 am on Friday. Concrete trucks will stage along Englewood Hill Drive if necessary. Due to limited space at the reservoir site, constuction crews will be parking off site and will be shuttled to the work site. All crew members and truck drivers have been reminded to slow down and be watchful since they are in a residential neighborhood. If you have any questions, please call Kirsten at 509-966-0272. Again, we thank all of our neighbors for their patience during this construction.